fingers polish mania: Another Subtle Mani-but with Holo Goodness! I am starting to get really uptight about all these subtle manis I keep producing. Why am I not learning my own lesson?? Oh well-at least this one has a beautiful holo in it. You just can't go wrong with a holo right? This is Hits No Olimpo Hera and Bettina Ocean. 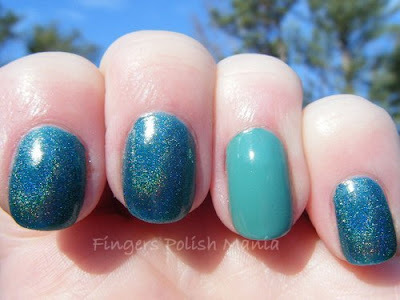 Both of these are gorgeous teals. We will see what my camera does to them! Also behind the polish is my cats favorite toy. Actually the only toy they will play with that is not a paper bag or a box. It is similar to those old weeble wobbles from back in the day. You can't tip it over and there is a feather on the top which isn't in this picture but believe me, they go nuts for this one! 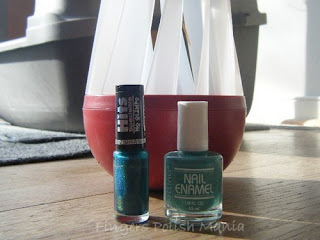 I started with Hera and did my accent nail with Ocean. Here are the results. Yup you guessed it. My camera messed up these colors and made them too blue. They are true blue green teals and lovely. I just love holos. Aren't those rainbows stunning? I then decided to stamp with XL plate A and did my usual funky french. I really like how this came out. Here are your shots. The indoor shot is actually the most accurate color wise. I am loving the sparkle showing through the design. Isn't this awesome? It's also a lot lighter in color than I have been doing lately. Trying something a little different! So what do you think? Is this awesome or what?